Last weekend I had some friends over at my place to help me celebrate my 29th birthday which fell during the week on May 13th. I decided it needed a theme, so it had to be TROPICAL! 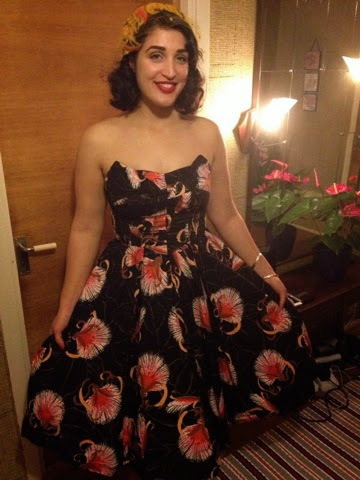 It gave me the perfect excuse to use one of my 1950's Alfred Shaheen dresses. I can't get enough of them! To me, they're meant to be for me. They are colorful, beautiful, and made in and inspired by Hawaiʻi. This one has a design that looks a lot like ʻōhiʻa lehua, a flower (and tree) native to Hawaiʻi. 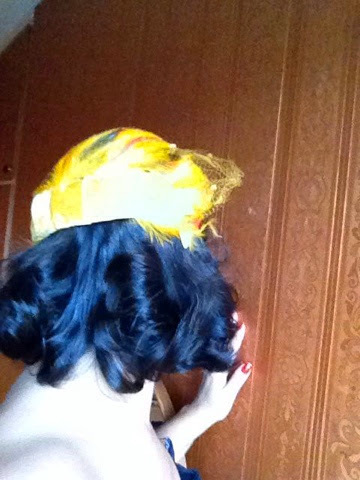 And I finally got the chance to use my beautiful feather hat i got from Vintage From Paris in Malmö. Unfortunately I didn't have a photographer handy at the time to help me take pictures of my hat, so I did the best I could. As an aside, I wanted to be careful not to make it a bogus, aloha-tiki-hula-hula party, though, because that stuff just gets tired and offensive for someone who is interested in 1950's kitsch but also happens to be a real live actual Native Hawaiian. That said, I think the idea of "tropical" is fun and doesn't have to offend someone's culture. 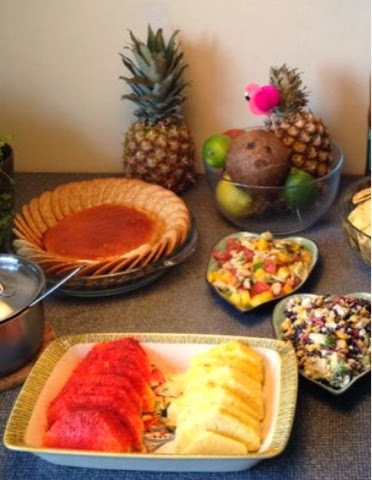 So I went with bright colours, flamingos, and tropical fruits incorporated into the meal. Whenever I have parties, I'm so focused on getting food out and making sure everyone is all set that I almost always forget to take party pictures! So the coconut candle and flamingo table decorations didn't get to make it onto the blog. But of course I managed to take pictures of the food! I also got this joker to take a picture with me. He was a big help throughout the day! I was serenaded by my friends - accompanied by guitar even!- as I blew out the candles on the lilikoʻi (passionfruit) cake I baked. 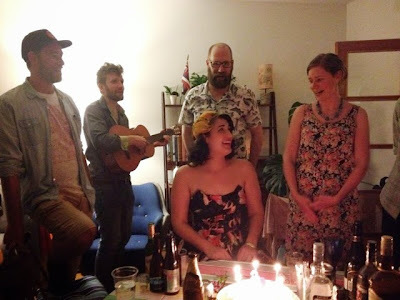 All in all, it was a lovely (early) birthday weekend filled with friends, food, and fun. It can't get better than that! I just found your blog and love it! And your dress is just beautiful and perfect on you! 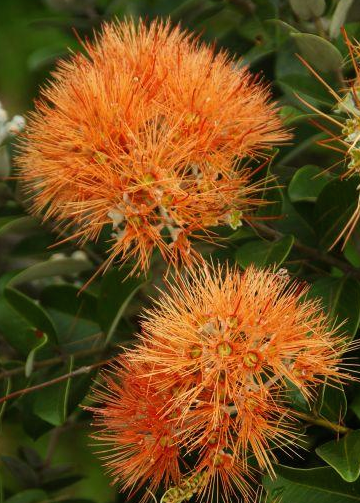 I currently live in New Zealand (but am originally from Denmark) and that flower looks so much like the pohutukawa flower that grows here. 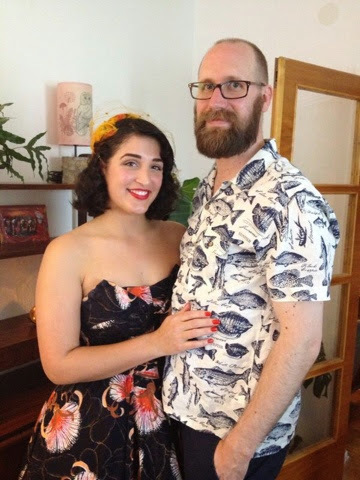 I really wish that I could find similar vintage dresses with the local flora of New Zealand. It's so beautiful! But unfortunately I don't think things like that has been made here. I look forward to following you blog. I think it's really neat that you've done the exact opposite of my move - from Scandinavia to Polynesia instead of Polynesia to Scandinavia. What brought you there? Living in Polynesia as a Scandinavian must be a really interesting cultural experience for you too. 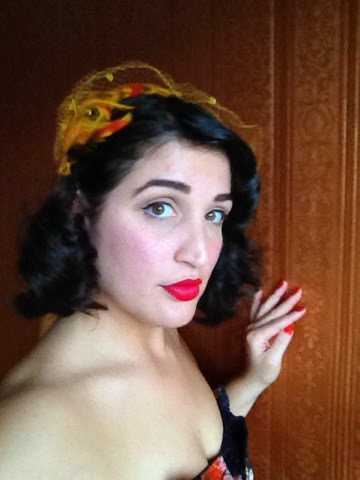 Retro/Rockabilly/Tiki is to varying degrees quite popular in Scandinavia (and even more so in parts of the United States) and so I can be quite protective of my native culture when it comes to "tiki culture". 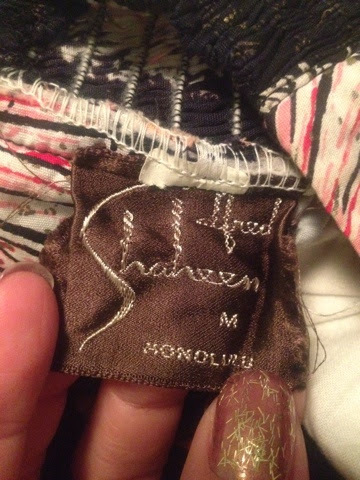 There aren't many indigenous people who are really interested in vintage, so I think it's something non-native vintage enthusiasts don't even realise they might need to consider. I really appreciate your comment - I don't get too many comments, so I was so happy to see yours. I hope you continue to enjoy my blog!